The 6000W HMI Fresnel Light Kit from ikan includes the Lightstar 6000W HMI Fresnel head, Lightstar 6000W electronic ballast, 49' head-to-ballast cable, barndoors, gel holder, and yoke. If you need a whole lot of light to mimic the sun, light large sets or to raise the ambient light level on location, the Lightstar 6000 Watt HMI Fresnel Head from ikan is a great choice. The light packs a lot of power and features that have become a staple on sets, in studios, and on location. The Lightstar 6000 uses a separately purchased HMI lamp which not only projects light with a color temperature of 5600K for shooting in daylight, but also outputs the equivalent of a 24,000 W tungsten Fresnel. 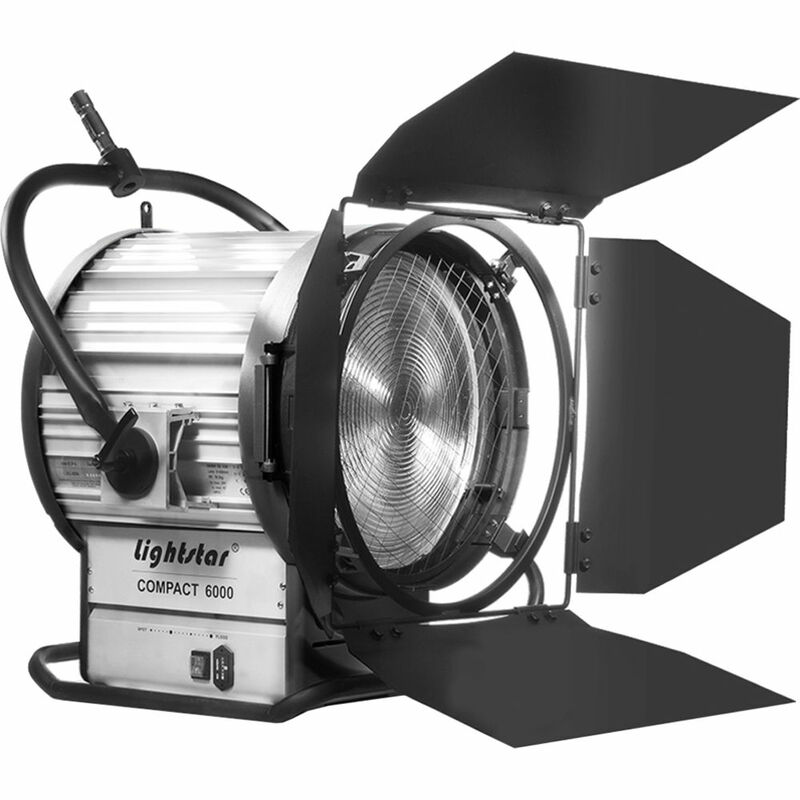 The fixture's 16.5" lens offers an expansive spot to flood range of 6 to 58-degrees for sharp-shadow sunlight effects or an even flood to fill silks and other modifiers. Beam adjustments are made with a simple rotary knob. The included 4-way barndoors give you further opportunity to shape the light beam. The aluminum Lightstar 6000 comes with a yoke with a 1-1/8" pin, is air-cooled, and is IP23 water-resistant. To operate the lamp head the LEB-005 6000 Watt Electronic Ballast must be purchased. Compatible with 6000W Lightstar lamp heads, the 6000W Electronic Ballast from ikan accepts 180 to 250 VAC input voltage, is dimmable from 50 to 100%, and outputs flicker-free power up to 10,000 fps. The unit has an IP22 rating for water resistance and weighs 50.7 lb. The ballasts's 49' head-to-ballast cable allows it to be easily isolated from the lamp head when needed.